Grief is not a subject that is all around fun to feel into, easy to confront or effortless to talk about. And as the English language is so limited, there is no real translation meticulous enough to render how this tumultuous heart ache really feels on the inside. These feelings that arise both psychologically and physiologically can be so hard to face that sometimes they are pressed down into the deeper depths of our being and held for many years if not life times, causing some form of dis – ease within the mind or body. Sometimes grief feels so grueling to face, that attempting to take a blind eye seems easier – I know I’ve hoped the heavy feelings would just slip away into desolate winds… but this is simply not the case. Some would describe grief as conflicting feelings caused by the end of or change in a familiar pattern of behavior. Grief can show up in our lives in so many different ways. Grief doesn’t mean that we necessarily have to loose a loved one, or experience a physical death per say. It could be that we’ve lost a job, gone through a divorce, lost custody of a child or even lost a house – as these are all forms of loss and can create the same emotions to those of us who experience death. Even the anticipatory grief of a loved one can develop into a painful experience as expecting a death or loss in the future is still within the same realm. There are so many different presentations, and not to sound deeply melancholic or depressive, but none of us gets out of this life without experiencing some form or another. The one guarantee in this life is that we will all experience grief, so we all must find a way to feel into it and accept it, so we can learn from it and thus move forward once again. In time, once strength returns again, we might even be able to share and help others through the same hardships we experienced. And as heart wrenching as it may be, it is actually quite a positive learning tool; for if we do not experience the feeling of pain, we cannot understand what joy and happiness is, as we have nothing in opposition to compare it to. Ultimately it boils down to love. If we do not experience love, than how do we experience grief? When grief arises, it shows us that we loved with such an intensity – and that intensity is actually a beautiful gift. As Martine Prechtel says perfectly so “if we do not grieve what we miss, we do not praise what we love”. It is thus a gift that we endure the feelings of grief, anger, sadness, loneliness as it is an expression of how much we loved in the first place. And aren’t we impeccably fortunate to experience this opportunity of such love? With this understanding, we can look to our friend surrender and hope to let go of the things we cannot change and accept the things that are -and yes it may be one of hardest lessons we will go through, but it can become one of the greatest lessons of life and with perseverance, it will aid us in becoming an even stronger person. Then, if we can – we can share and pass this strength on to our children, friends and loved ones which can be some of the greater gifts of life. We help not just them but actually the evolution of the whole of humanity through the ripple effect of our personal healing. So with that said, to transmute these energies of anger, fear, sadness and trauma, we can find great comfort in knowing that our experience can assist the evolution of not just our soul, but many others too! But first, how can we do this? How can we open our hearts to move through this pain towards healing? How can we turn these misfortunes into teachings so we can feel whole and happy once again? 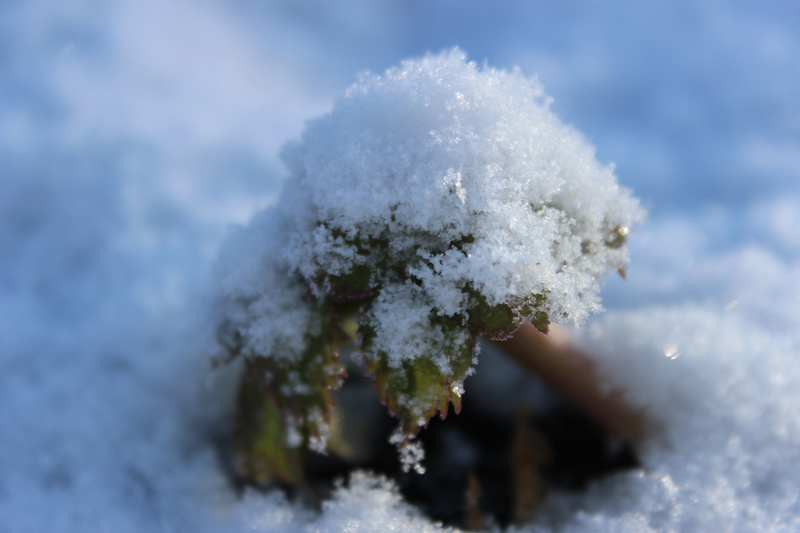 Well my dear friend – I’m sure you have already guessed, we can turn to the plants for help and healing. Our green allies can help so much in supporting and building the heart whole once again, helping us find strength, courage and to find relief as we move through these emotions into greater healing. The intelligence of these beings are so brilliant, that sometimes we might need to accept that we do not have capacity to understand them in our limited human mind and simply trust this these plants will shine a light that will open our hearts towards a healing that we may have not known possible. Now with that said, I’d like to take this opportunity to share a few plant allies who may shed some light into those of you who may be also experiencing some form of grief at this time. ROSE (Rosa spp.) Any species of rose is powerfully healing, but the Nootka Rose (Rosa nutkana) is the one I personally prefer to work with as it’s the wild one that grows around me. Rose is one of our top most used plants for times of grief and trauma, as it’s very specific for held in or pent up emotion. This plant will allow for energy to be moved and a great release to be let go – if we are not able to let ourselves release and feel into our pains, then we are refraining from our own healing and growth. 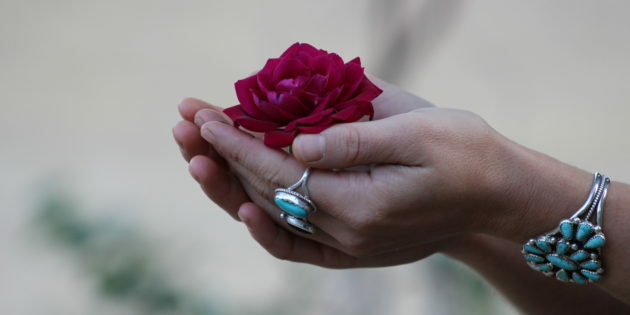 Rose helps us to find balance once again within our self. It opens the heart to allow us to be vulnerable. It allows for strength and empowerment to shine through when we are feeling soft. The petals and scent of a rose embody this heart opening sweetness that melts our vulnerability, and the thorns share this representation of that personal empowerment. By adding a little Rose to a formula will uplift suffering from any form of anxiety, anger, insecurity, grief and depression and gift us with light to lift our spirit. I was at the Portland Plant Medicine Conference a few years back helping Sajah & Whitney with their Spagyrics booth. One afternoon while classes were in session and the hall was was quiet, a young woman approached me and asked if we had any remedies that would assist the emotional heart. 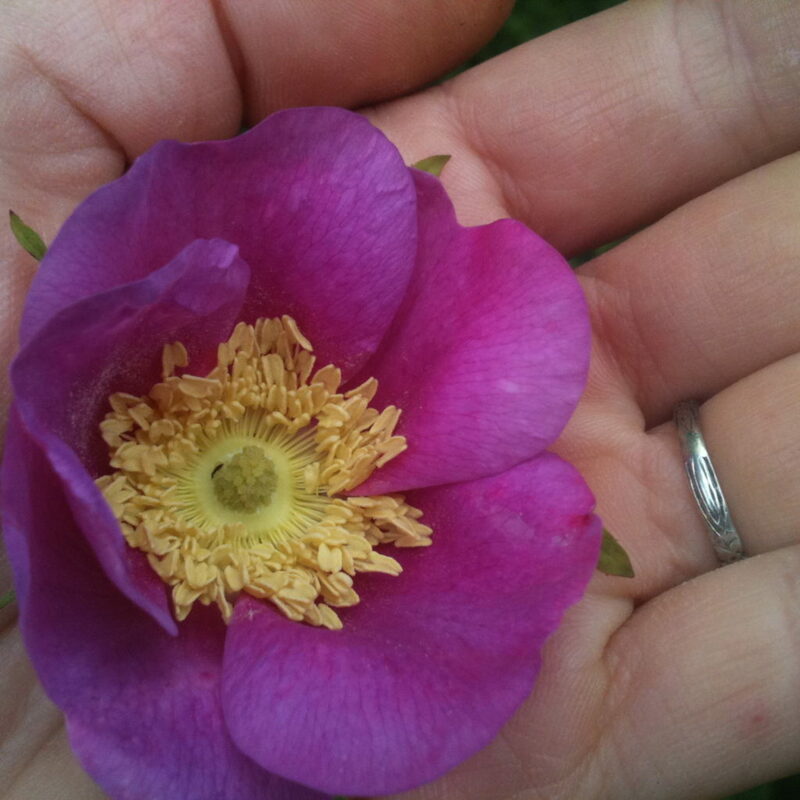 I looked at her, smiled and handed her a bottle of our Wild Rose Spagyric Essence. She took a step back, held the remedy for a moment and then placed a few drops onto her tongue – in not a moment more, her face flushed, her lip quivered and tears started rolling down her face… she started apologizing. I quickly assured her that she mustn’t feel embarrassed and that this was actually the medicine of the Rose at work, that it was simply a healing taking place and told her to just surrender into her experience. I followed by giving her a big hug and she smiled and gave thanks. When our interaction was over, she walked away with a Rose remedy in hand, and I marveled over how powerful that medicine had been that day. In retrospect, I should have given her the Rose essence with some caution that it could bring up emotions quick, and if she didn’t feel that she was in a safe place to feel them and maybe even cry – she may want to try something a little less specific. Rose can be quick and to the point, so make sure to give a heads up to whoever you might share it with. HAWTHORN: (Cretaegus spp.) “Crataegus” derives from Greek…”kratos” means strength and “akis,” sharp. This is our classic heart tonic remedy in Western Herbalism, known for its mightiness and power to normalize the heart in whatever direction it may see fit. It brings balance and integrity into the tissues by simultaneously strengthening any weakness and reducing hyperactive states of stress within the cardiovascular system. This can not just work on the physical body, but can also apply to the stability of our emotional health when matters of the heart feel uneasy or not supported. When a weakness penetrates our spirit and we feel fragile or frail, Hawthorn will help in restoring strength once again. It may support when we need help with forgiveness, bringing about a softness to move ourselves onwards. Hawthorn can be used when we also fearful of death, being a gentle hand to those of us who may be ready to ‘pass over’ to ease that transition. Personally, I have found it strengthened my assurance of living life when I felt life was so vulnerable. In my own life, I had a few friends & family members pass this year and noticed that I could not stop thinking about how fragile life was. Hawthorn restored that subtle confidence once again and helped me step out of living in fear of death. We can carry the sharp, fierce thorns of Hawthorn as a protective talisman. Carrying these thorns can be helpful to keep clear emotional boundaries while moving out into the world when we are feeling deeply vulnerable after heartbreak. LINDEN (Tilia spp.) The doctrine of signature is so clear in this tree who wears heart shaped leaves. This delicious sweet tasting tree releases tension in the musculature and circulatory realms of the body, softening tension and lifting off worry. Linden flowers support restlessness, improves sleep and lowers anxious states. It’s specific for anxiety around the heart as it physically supports the vasculature of the circulatory system, gently widening blood vessels and lowering blood pressure. 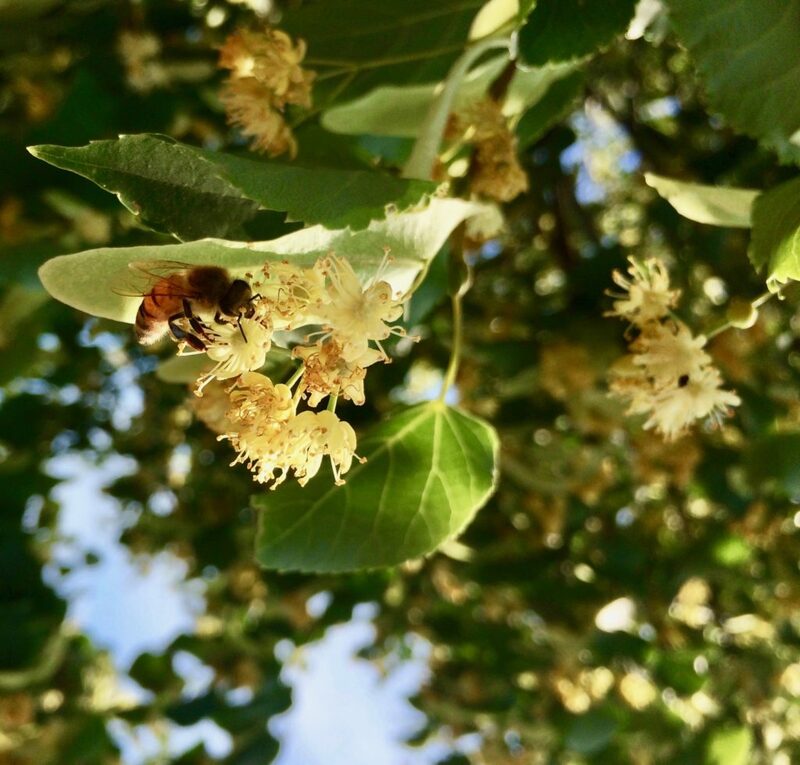 Linden will reinstate a sense of calm and will gladden the heart with its sweet, aromatic blossoms. BLUE VERVAIN (Verbena hastata) A wonderful plant for those of us who feel tension in and around the chest, shoulders and neck – this plant promotes an overall sense of well-being and combines wonderfully with the other herbs listed above. Blue Vervain works to take stored up energy in the head and shoulders and disperse it down throughout the body. This can be really helpful when we feel tense from spinning thoughts. This plant will aid us when we are both exhausted and incredibly wired from stress, calming the us to a manageable and restorative place. Blue Vervain will help us to move through melancholy by warming the heart when sadness feels over-consuming. LEMON BALM (Melissa officinalis) is such a wonderful plant to lift depression and sadness where grief has taken over. It can help to bring back a sense of our inner child again, taking away the seriousness of adult circumstance to imbue a lighthearted cheer we once had… something I think we all need in times of grief. John Evelyn, a writer of the 17th-century said Lemon Balm “comforts the heart and driveth away melancholy and sadness”. Using a blend of Lemon Balm with Linden is a great pair to lift any sadness from a burdened heart. BEE BALM (Monarda fistulosa) Our friend Sean Donahue shares that this plant is traditionally used by the “Muskogee Creek tradition to clear the ways in which death hangs over and clings onto the living.” Finley Ellingwood, the 1919 Eclectic herbal physician said “It soothes nervous excitement when due to exhaustion, promoting sleep and rest.” Being a cousin of Lemon Balm, it can be used in a similar way for calming the nervous system and uplifting the heart. Monarda, Lemon Balm and a little Rose with some honey is a wonderful formula for an adult or a child who has experienced trauma. 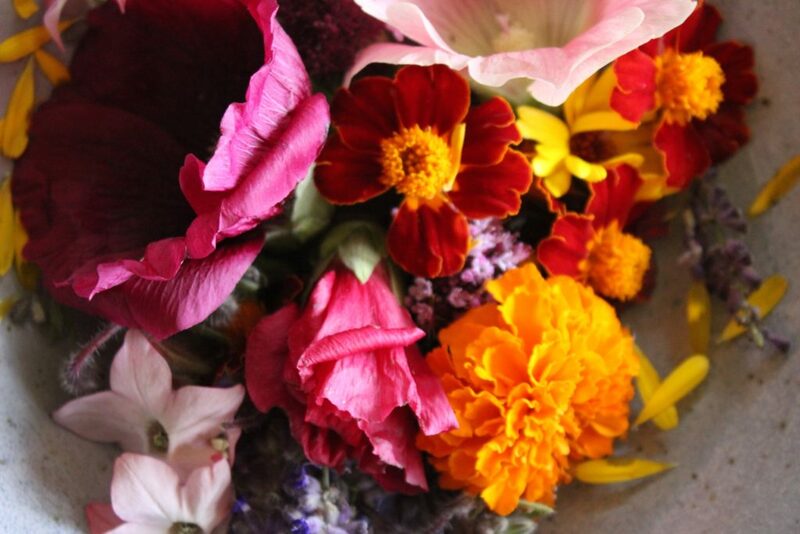 Even just spending some time with the flowers could be incredibly uplifting & encouraging. BORAGE (Borago officinalis) From the Latin words cor (courage) and ago (I bring), Borage gladdens the heart and lifts the spirit. Stories tell that Roman soldiers consumed wine of Borage before stepping into battle. Drinking this flower tea may fortify our heart with courage and bravery to step through a time of upheaval. Its bright blue & purple flowers are so striking, they will illuminate any eye that rests upon them. Borage is SO easy to grow, so it’s a wonderful plant to have growing in your garden to brighten your day whilst watching the bees play amongst its blossoms. HOLY BASIL (Ocimum sanctum) As I write this, fresh Tulsi from my garden fills my kitchen with its sweet, spicy aroma, uplifting my senses and filling my home with a warm, comforting feeling. Holy basil is connected with the throat and heart chakras, reinstating support in the voice so that we can express what needs to be released away from the heart in order to move on. This can be useful in times of feeling choked up or having a hard time expressing what’s been experienced through a traumatizing experience. Holy Basil may ensure that both these areas of the body are working together in unison so that it’s easier to release these plaguing thoughts that weigh the spirit down. Plants like Holy Basil are also very aromatic, being useful to clear unwanted energy, while helping to calm and restore the nervous system. MOTHERWORT (Leonurus cardiaca) As the name cardiaca implies, this is a well known remedy for the heart. Motherwort works on all the vasculature within the circulatory system, relieving tension within hypertensive states while acting as a tonic to the heart. Mathew Wood points out a doctrine of signature in his book the ‘Earthwise Herbal’ that its correspondence to the heart can be seen in the rhythmic repetition of flowers up the stalk of the plant, representing the consistent pulse of the heartbeat. 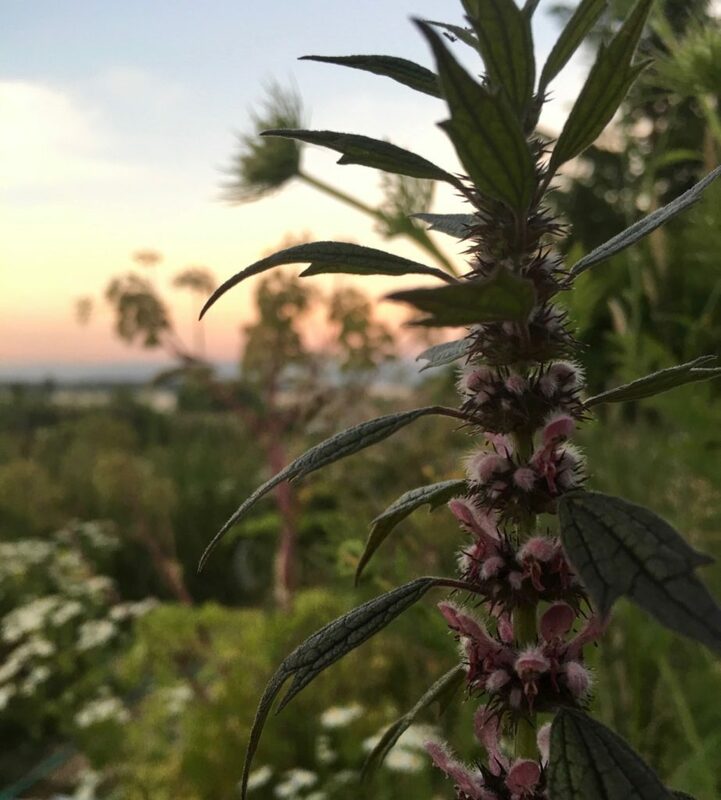 Motherwort is a good remedy to turn to during times of weakness within the heart space. It can calm unease and anxiousness that can be associated with turbulent emotions – especially if it’s presenting in our physical body as palpitations and tension in the chest. WOOD BETONY (Stachys betonica) is a relaxant and tropho-restorive to the nervous system. Wood Betony is a slightly relaxing herb that assists to anchor a person into their physical body. This can be implemented after a traumatic event when the spirit may have partially left the physical body in order to protect itself from harm. It’s also an incredibly ally when the body feels consumed by a dizzying sobbing grief during the physical breakdown of uncontrollable tears. In these situations, Wood Betony can help to calm the spirit an anchor it safely back into the physical body. It enkindles courage in times of weakness, restoring strength and empowerment through its action within the solar plexus. LAVENDER (Lavandula angustifolia) works to calm strong emotions by bringing our presence back into the moment. Lavender can also help in releasing pent up emotions while allowing energy to move and flow through the body, volatilizing it up and out. These effects can be felt even just through smelling the essential oil, which can immediately ground and calm the nervous system when we feel frantic. ST JOHN’S WORT (Hypericum perforatum) is classically known as “sunshine in bottle”. This plant is a nerve tropho-restorative meaning that it works to restore and tone the nerves within the body. 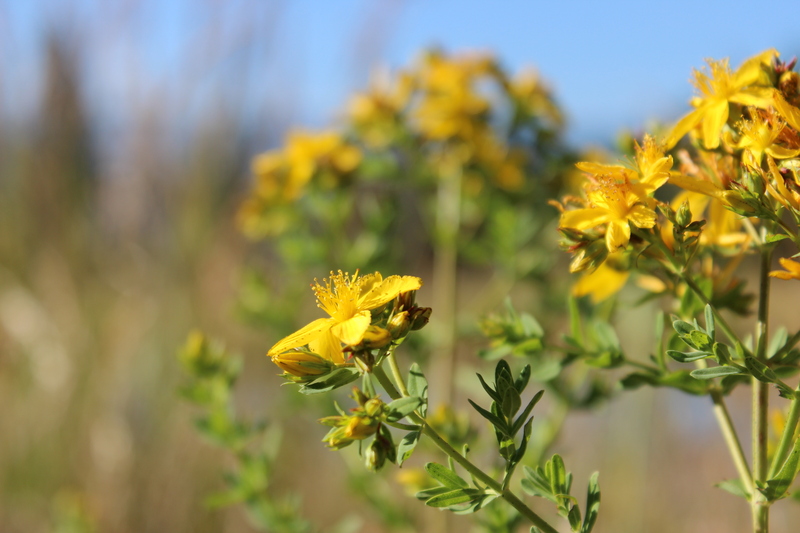 St. John’s Wort is used to ease anxiety, tension, and is commonly known to support seasonal affective disorder or mild to moderate depression. Taking St. John’s Wort might help when we are worn out from old grief and needs some nervous system repair. In this case, I love the a combination of Milky Oats (Avena Sativa) and St. Jonh’s Wort. Note: please take caution when considering taking St. John’s Wort as it has many negative side effects with medications. If you’re considering taking this herb internally, it’s important that you first consult a qualified health practitioner or doctor if you are on any pharmaceutical drugs before you consume this herb. SKULLCAP (Scutellaria lateriflora) This plant does wonders for the nervous system and brain as a relaxing nervine. Skullcap is a good friend in times of anxiety when the brain will not stop with whirling thoughts around and around. Taking Skullcap during times of grief can help to quiet the thoughts so we can focus on the present and not re-live a painful experience repetitively in our minds. This can be incredibly useful when such thoughts or recirculating traumatic memories prevent us from sleeping. MIMOSA (Albizia julibrissin) A very uplifting remedy known as the “collective happiness” tree in China. We cannot help but feel happy in the presence of Mimosa flowers. The blossoms shine bright pink with a firework like shape exploding mid air. This flower is known to bring relief when we feel burdened from continuous tears that will not stop – allowing us to break for a breath and feel peace to roll into our heart. It is known in Chinese Medicine as a Shen tonic, specific for uplifting the spirit and awakening a sense of happiness. WESTERN RED CEDAR (Thuja plicata) Not necessarily known as a remedy directly for the heart per say, but I find that taking a simple walk into the forest brings a sense of calm and healing within my being when I’m dipped in sorrow or sadness. When I place myself under the great Cedar tree, I feel as though a great grandfather wraps his boughs around me and provides me with deep comfort. 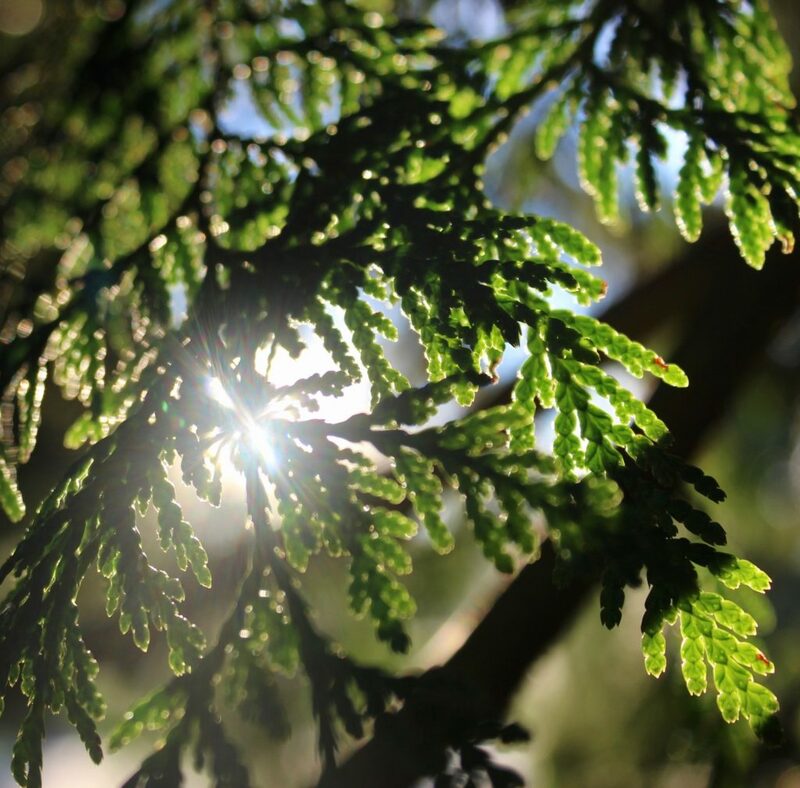 If you don’t live close to the Cedar tree – burning any form of Cedar as incense will also bring forth comfort as its been used for many centuries for clearing and cleansing stagnant negative energies. It can help with moving those stagnant energies with the heart when dealing with old stuck emotion. With all that said, I do want to take a moment to shine further insight to a few flower remedies that could also be of benefit and a blend of essential oils that I use which has helped to lift my sprits. I also wish to mention that supporting our body with some trophorestatives and adaptogens in times of deep stress is a good idea. Milky Oats (Avena sativa) is the classic trophorestorative herb in Western Herbalism, which will be useful in times of any stress. And adding herbs like Rhodiola (having a rose-like fragrance), Ashwagandha, Schisandra, Rieshi, American Ginseng or Astragalus can also support the adrenals (little organs that take care of our stress response) and immunity, as these systems can become depleted in times of great stress or trauma. It’s also important not to neglect the deeper dimensions of pain and trauma after a serious loss. I recommend taking the opportunity to actually talk to a professional, which can be a critical aspect in the alleviation of pain, discomfort and distress as it’s hard to traverse alone. So if you’re experiencing grief, yet feel shy or afraid to reach out to talk with someone – perhaps take a plant ally to give you that extra strength and courage to reach out! RESCUE REMEDY: is for emergencies. If there is bad news, a family upset or bereavement; feelings of confusion, fear, or any traumatic experience, this remedy will help to face the situation. OLIVE: is for those of us who are exhausted after long periods of strain through personal difficulties, an intense long illness or nursing someone else for a long time. HONEYSUCKLE: for over attachment to past memories. GORSE: for feelings of extreme hopelessness and despair and for those of us who have given up the fight. Gorse is for those of us who feel lost of all hope and feel there is no light at the end. WILLOW: is for feeling short-changed by life, for feelings of resentment and bitterness – it helps to regain a sense of humor. STAR OF BETHLEHEM: is for the effects of trauma, mental or physical as a result of accidents, bad news, bereavements, sudden disappointments or frights. I have been taught to use this flower essence with caution this as it can bring up emotion quick, and like Rose – might be overwhelming. SWEET CHESTNUT: for agonizing mental anguish described by Dr. Bach as “the hopeless despair of those who feel they have reached the limit of their endurance”. WHITE CHESTNUT: is indicated for obsessive, worrying thoughts that seem impossible to control. For those of us who cannot let go of the unhappy events and keep reliving them mentally. WALNUT: for those who find it difficult to adapt to change or who are over sensitive to certain ideas, atmospheres and influences. This blend may be formulated as a tea, and by adding some raw honey to sweeten this blend even more will just add that little extra sweetness when you’re feeling the blues or working through tough stuff. Even making a sweet cordial or syrup could be really advantageous. This also makes a great tincture formula too! Ylang Ylang- Helps to reunite our emotional and sensual natures. Harmonizes the mind and senses. Palmrosa – for those who need to feel love and security, helps to ease emotional upset. Petitgrain- similar to Neroli but has a stronger anti depressant properties. In closure, it’s been helpful for me to focus again on what’s in front of me now, to not loose track of those pieces of light that still exist in my life now. Remember that there is still love that exists both in the heart and in this world… even if it doesn’t feel so sometimes. If we resist change, we will become stuck. We live in an ever evolving world that is constantly changing, moving and evolving. We must trust that beautiful things will happen again, so stay open to enjoy them! And remember they too shall pass, and that’s ok, because that is the nature of everything. By looking past the things that we have lost and focusing our attention on a bubbling brook or on smelling a flower, we will take ourselves from living in the past to the present again. 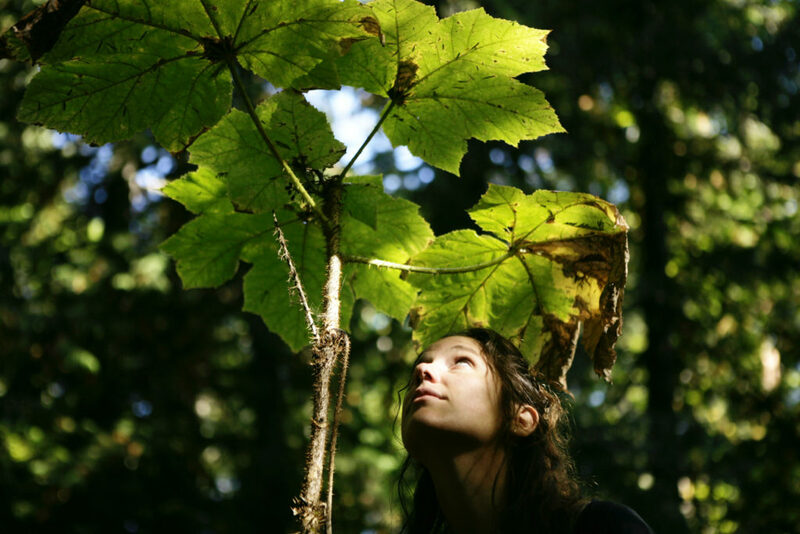 It’s important to feel an appreciation for the living things that still exists today, so we can continue to cherish the love that’s still alive around us now.